Boho Beach Bungalow: Wrap it Up! No matter my underdeveloped finger dexterity that all young children fall prey to (have you ever tried to teach 2nd graders how to crochet to build finger dexterity? Because I have. It ain't pretty.). At 5, I was wrapping presents and tying bows with the best of them. I still to this day have very rarely ripped wrapping paper--in our family we like to keep wrapping paper for at least 20 years and as such gently pry tape off the corners of gifts to preserve the paper for all eternity. The benefits of such actions are numerous! Every holiday you have a ridiculous amount of paper to select from (the paper must always be appropriate for the recipient of the gift), you can save by not purchasing new wrapping paper every time you see some (like we can resist), most often times the gift giver will engage in deep conversation regarding the history of the particular paper with the recipient prior to being allowed to open the gift, and let's not forget that some day we may just start a wrapping paper museum. There are rules in my family that must be followed. 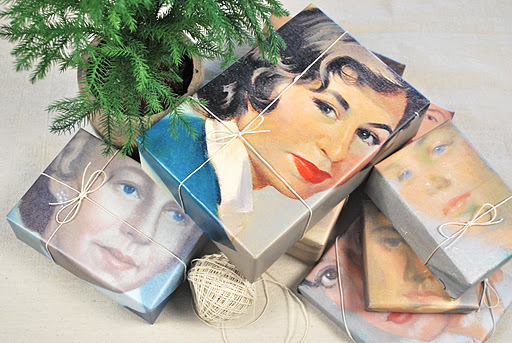 The first rule about wrapping paper cult is that you don't talk about wrapping paper cult. It continues: you must wrap well. Clean crisp corners are a given. If you can't use your fingernail or some other object to create the most straight perfect lines to envelope the package (if rectangular or square) then you won't cut it in my family. 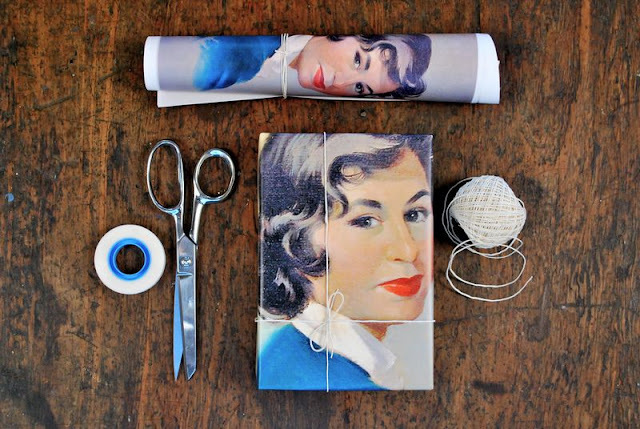 Bags are a faux pas only to be used when there is no other earthly way to wrap a gift. If you do use a bag, you better have a good reason and there also better be some intricate tissue layering and bow curling. Everything must have a bow, and don't dare use a stick-on. Tags are less strict, I'd say on average 47% of gifts lose their tagging while in transit or otherwise, but this is viewed as "fun" or flat out omitted. 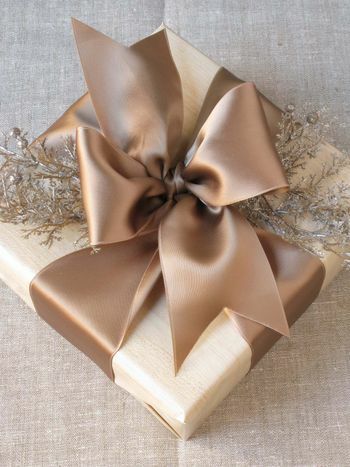 The overall taste and feel of the wrapping paper must be appropriate for the gift and recipient, and in most cases should illicit a comment on how well it is matched with the recipient (manly deer paper for the manly grandfather). You must not rip the paper unless explicitly given permission by the wrapper. Bonus points are given for going above and beyond (one year my mother somehow fashioned an approximate 6-pointed corner for a cylindrical box) and every year a clear cut winner for "Best Wrap Job" is declared. Rules apply to all ages, penalties are issued for violations. Welcome to the world where invisi-seams are highly disputed. In the extremely unlikely event that you are unfamiliar with this method of wrapping, let me just cover all the bases. First introduced by my Aunt Leslie circa 2006, the practice of using invisible seams in gift wrapping endeavors is both a somewhat controversial and revolutionary practice. It is, however, a rather cumbersome practice especially to those who are a) not expecting them and b) hard of seeing (yup, that's a term now). So all are aware, the term refers to the practice of lining up all paper edges with the edges of the package. To go in depth a little further, the exposed edge cannot be cut but must be folded under so as to have a perfectly straight edge. Most disconcerting are the times when double sided tape is used in conjunction with the invisi-seams. The use of invisi-seams increases the likelihood of tearing an edge of the paper (major faux pas, especially if the paper is from when my parents were still married; ie. 23+ years ago), but also contributes to a heightened feeling of anxiety in which case you may lose composure and rip the paper. I may or may not be referring to the incident back in '09 when we all were at our wits end trying to save the paper on gifts wrapped by my aunt, and my mother, a founding member of the wrapping paper cult, broke down and ripped [gasp!] the paper in such a fashion that it had to be recycled, TO THE TRASH. Other difficulties with the invisi-seams plague those with less than perfect eyesight. If you are in fact my mother, who is now at the age where candlelit tables don't provide enough light to read the menu (sidebar: have any of you been to High in Venice, CA? Their menus light up! ), and you want her to read or see anything that may be on either a small iPhone sized electronic screen (forget when I had my inadequate ultra small blackberry screen!) or large piece of paper it must be held at arms length, then invisi-seams can be quite challenging. We don't hold it against her or anything; if I'm correct the incident was with new paper still bountiful in quantity. But it's hard to forget the desperation in her eyes and movements, blindly clawing at the bottom of the present, searching in earnest for the invisi-seam. Poor Mom. Aunt Leslie doesn't just seal the middle with 1 piece of tape, but is known to further reinforce with multiple tape sites along the edge to prevent puckering (not just a faux pas, but utterly unacceptable). Invisi-seams are therefore not required in presentation. Moving forward. Every Christmas my grandmother inevitably has not wrapped 95% of the gifts she has purchased for me, my cousins, my aunt, mother, brother, grandfather--and the list goes on. When I was younger and still had to be bribed to do "chores" I would extort small amounts of money for each present wrapped on her behalf. Eventually I was taken advantage of for my skilled little gift wrapping fingers and forced to wrap without compensation. One year I was so strung out on wrapping for my dear grandmother that when we were finally opening all of our presents (which you have to do one-by-one in a circle taking turns so everyone can watch and see the wrap job) my Aunt Leslie grabbed a present wrapped by me on behalf of my grandmother. There was just one indicator that tipped her off as to the identity of the wrapee; the tag I had written: "To: Aunt Leslie, Love: Mom". 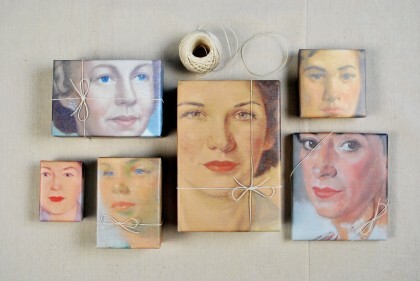 I mean, just look at how creepy/awesome your presents can look! Get the full how-to here. 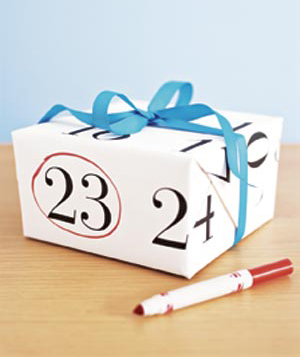 Other bright ideas--enlarge a calendar to make interesting gift wrap. 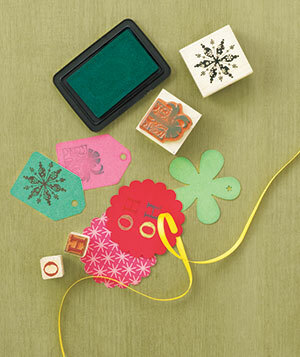 Make your own tags by using colored paper and stamps with bright ink, or use cut outs from previous holiday cards. 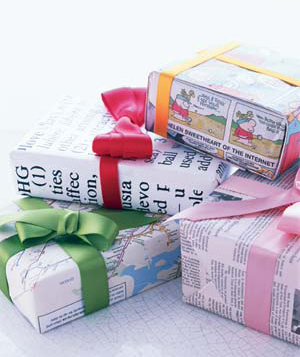 Diversify your thinking on what constitutes wrapping paper: use old maps, comic strips, wallpaper--the sky's the limit! You can also make your own paper (we did one year) by laying out and taping leaves (or other objects) on plain paper and spray painting gold. I'm sure we still have that paper in the archives. 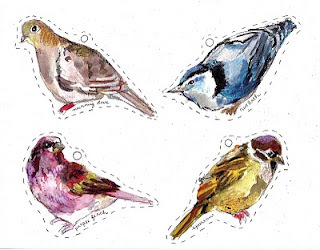 Beautiful bird tags by Rebecca Kallum. 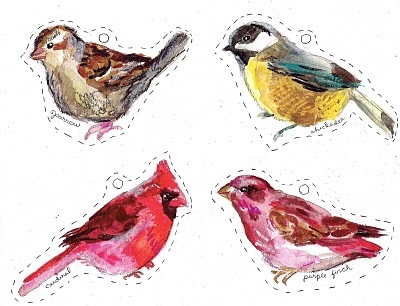 Visit her blog for the full size images and free download to print! Hopefully these fun ideas will make an appearance under your own tree this year (or menorah, or wherever you're stashing presents). And here's to the wrapping paper cult!